As long as everyone can agree on an operating system, Apple and Amazon are making it possible for families to share their apps and media across devices, making it just as easy to share a digital book as it is to share a physical one. 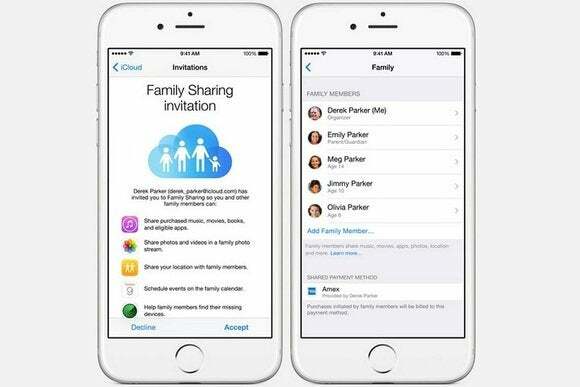 Apple announced this feature, called “Family Sharing,” in June, and it's available now as part of iOS 8 and OS X Yosemite. It allows families with multiple Macs and iOS devices to access the same apps, movies, TV shows, music, and books, even if they're using separate accounts. It also lets children ask permission to buy an app remotely, letting parents approve or decline the purchase from their own devices. Amazon's version is called “Family Library,” and it'll launch in October. It allows family members to share apps, books, and Amazon Prime Instant Video across devices running Fire OS 4, such as Kindle Fire tablets and Fire phones. There are restrictions, of course. Family Sharing works with up to six Apple accounts across 10 devices—five of which can be Mac computers. Amazon's content restrictions are a bit tighter than Apple's, as users can't share music or a la carte TV and movie purchases. As for device restrictions, Amazon hasn't specified a hard limit, but Re/code reports that all Family Library accounts must have the same billing address. Still, Amazon has the advantage of offering multiple accounts on the same device. That allows parents to create kid-friendly profiles and set time limits on usage without purchasing separate tablets for each member of the family. Both plans are launching in tandem with new hardware from Apple and Amazon. Apple's iPhone 6 and iPhone 6 Plus arrive on Friday, and Amazon's new Kindle e-readers and tablets are shipping in October.